White yam or African yam (Dioscorea rotundata) is a new crop species of edible yam introduced from Nigeria. 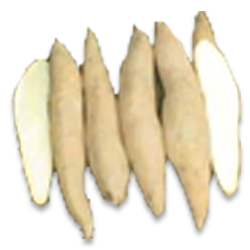 Sree Subhra: The tuber contains 27-28% dry matter, 21-22% starch and 1.8-2% protein. It is drought tolerant with 9-10 months duration. Sree Priya: The tuber contains 25-27% dry matter, 19-21% starch and 2-2.5% protein. It is drought tolerant and duration is 9-10 months. It is suitable for intercropping in mature coconut garden and with banana. Sree Dhanya: It is the first dwarf variety. The tubers have 28-30% dry matter, 22-24% protein and 0.3-0.5% sugar. FYM 15 t/ha to be applied at the time of land preparation followed by application of NPK fertilizers @ 100:50:100 kg/ha. Full dose of P fertilizer along with 50 per cent of N and K fertilizers to be applied as basal when 50 per cent of the planted setts sprouts. The balance 50 per cent of N and K fertilizers to be applied as top dressing, 1 month after the basal dressing which could be combined with intercultural operations. In this method clean and healthy yam tubers weighing about 1 kg are cut into cylindrical (disc-like) pieces, each about 5 cm thick. From each such piece, 2-4 small pieces (30 g) could be obtained by cutting the disc longitudinally or along the two perpendicular diameters. Such a piece is called a "minisett". The minisetts are then spread out under light shade for an hour with cut surface facing up before planting them in the nursery seedbeds. The minisett takes 2-3 weeks for sprouting. At this stage, they are transplanted to the main field at a spacing of 50 cm on ridges taken 1 m apart.